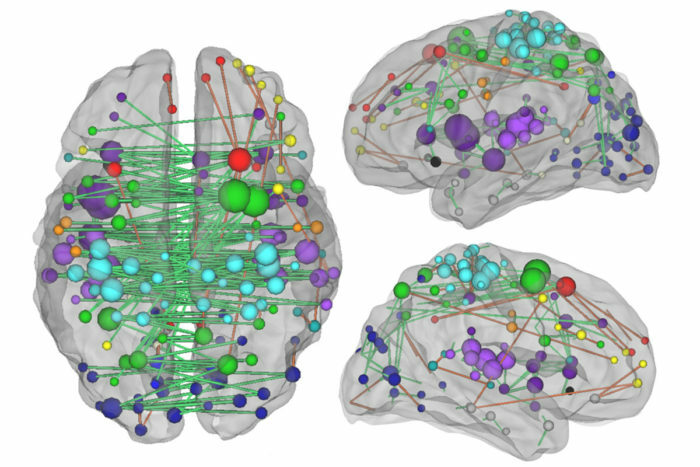 Understanding the network of connections between brain regions — as depicted above — and how they are changed by a stroke, is crucial to understanding how stroke patients heal, according to new research from Washington University School of Medicine in St. Louis. Close to half a million people survive strokes every year in the United States, and many are left with long-term disabilities. The options for treatment, after the damage is done, are limited, and predicting who will recover and how much is an elusive goal. Now, two new studies from Washington University School of Medicine in St. Louis indicate that current clinical practices may be missing a key aspect of stroke-induced brain damage. For some cognitive functions, such as memory and attention, the severity of a person’s disability correlates with the extent of disruption to the brain’s communication networks – something that is not measured by most brain scans. One study is published online the week of July 11 in Proceedings of the National Academy of Sciences. The other is available online in the Annals of Neurology. This research suggests that functional brain scans ­– those that measure damage to the brain’s communication network – may help predict recovery and guide treatment. Corbetta, graduate student Joshua Siegel, and colleagues including Gordon Shulman, PhD, a professor of neurology, investigated whether a brain scan known as functional connectivity MRI (fcMRI) could provide more useful information for assessing stroke damage. They used fcMRI to assess communication between brain areas in 130 stroke patients and in 31 people who had not experienced strokes. The technology allowed them to identify large disruptions to brain communication that occurred as a result of stroke. They also gave each participant a battery of neuropsychological tests to measure vision, motor function, language ability, visual memory, verbal memory and attention. The researchers found that the size and location of brain lesions correlated with vision and motor impairments, but problems with memory were better explained by changes to the networks of brain connections. Predicting attention and language deficits required knowing something about both the lesions and the networks. Currently, fcMRI is not used clinically, and the kinds of MRI and CT scans used to assess stroke damage don’t measure how well different brain regions work together. In a separate study, other researchers in the Corbetta lab evaluated what happens to damaged brain networks during stroke recovery. Do old pathways re-open, or are new pathways forged? Graduate student Lenny Ramsey led research focused on neglect, a kind of attention deficit that affects about a quarter of all stroke patients. People with neglect simply do not notice part of their world. Given a plate of food, for example, a person with neglect will eat only part of it and stop, thinking the plate is empty. Ramsey and colleagues studied 77 stroke patients with neglect and 31 adults of the same age who had not experienced strokes. The patients underwent fcMRI brain scans and completed a battery of neuropsychological tests ­at two weeks and and then three months after their strokes. The healthy adults also underwent two rounds of fcMRI scans and behavioral tests, spaced three months apart. The researchers found that as the stroke patients’ symptoms of neglect lessened, the patterns of connections between parts of their brain became more similar to the patterns found in healthy people. The people with neglect who experienced the best recoveries came close to restoring normal patterns of connectivity. The work suggests the possibility of treating brain damage by coaxing networks toward normal patterns of connections. Right now, treatment for stroke is centered on the first few hours, when rapid intervention with drugs or surgery can prevent brain tissue from dying. Once the damage is done, though, patients’ options are limited to behavioral interventions such as physical therapy. Transcranial magnetic stimulation (TMS) has been used experimentally to aid stroke recovery. It involves sending magnetic waves through the skull and into the brain, causing an electrical current that stimulates neurons in the targeted area. While the effects of the technique are not well-understood, TMS may be able to restore normal connectivity by stimulating neurons to make more connections with each other, thereby enhancing communication between parts of the brain. The work on recovery in people with neglect was supported by the National Institutes of Health (NIH), grant number RO1 NS095741, and The Rehabilitation Institute of Saint Louis. 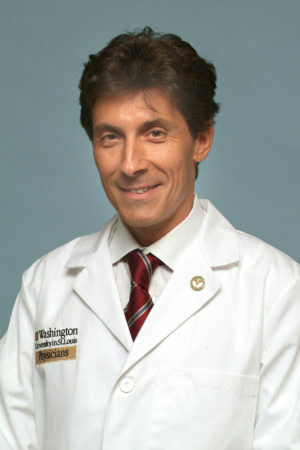 The work on impairment across multiple domains was supported by the National Institute of Child Health and Human Development, grant number 5R01HD061117; the National Institute of Neurologic Disorders and Stroke, grant number P30 NS048056; the NIH Medical Scientist training award; and the American Heart Association Predoctoral Fellowship, grant numbers 5T32GM007200- 39 and 14PRE19610010. Siegel JS, Ramsey LE, Snyder AZ, Metcalf NV, Chacko RV, Weinberger K, Baldassarre A, Hacker C, Shulman GL, Corbetta M. Disruptions of network connectivity predict impairment in multiple behavioral domains after stroke. Proceedings of the National Academy of Sciences. Week of July 11, 2016. Tamara Bhandari covers pathology, immunology, medical microbiology, cell biology, neurology, and radiology. She holds a bachelor’s degree in molecular biophysics & biochemistry and in sociology from Yale University, a master’s in public health/infectious diseases from the University of California, Berkeley, and a PhD in infectious disease immunology from the University of California, San Diego.